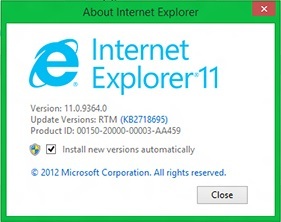 Windows Blue, the first major upgrade for Windows 8, will most likely pack the final version of Internet Explorer 11, the next important release of Microsoft's in-house browser that's reportedly under development right now. In addition to tab syncing and a download manager, Microsoft is also planning to bring WebGL support in the upcoming version of Internet Explorer, probably because its app is losing ground in the fight with the other browsers when it comes to web-based games and other services relying on this technology. 2-To reproduce the blue WebGL screenshot above, cut/paste this sample code into an .html file and display it in IE 11. There’s not much more to go on at this time beyond the initial hints, but it would be incredibly advantageous for the Web if Internet Explorer finally added native WebGL support. It’s quickly becoming one of the more important open Web standards as more people use it to make games and other graphic intensive content on the Web without plugins. Please always link back to this article by copying one of the codes below.